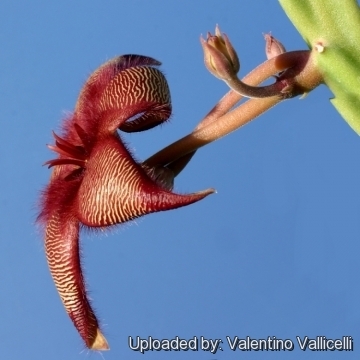 The dark-red flowers smell like a carrion and are covered by long setae that remember the fur of a dead animal , this way they attract flies for pollination (sapromyophily). The flowers are densely shaggy (hirsute) at the centre. Purplish colour simulate the rotting flesh of dead animals. These flowers attract beetles and carrion flies who pollinate the plant as they are fooled into trying to lay eggs on the flower. Origin and Habitat: This species is in nature limited to the South/western Cape Province of South Africa. Habitat: From winter rainfall area. 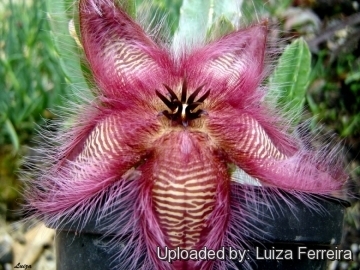 Description: Stapelia hirsuta (a.k.a. 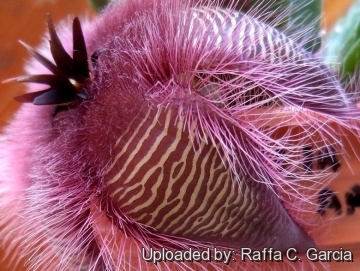 African starfish flowers is best known for its foul-smelling flowers. It blooms a large star and it is 5 to 15 cm wide. Notes: S. hirsuta is a very variable species with many hybrids both in the wild and in cultivation. Since the various forms are connected by intermediates it is extremely difficult to recognize infraspecific taxa. Stem: Leafless, subquadrangular, ascending, usually fine-haired, green which redden in full sun and during the winter month. 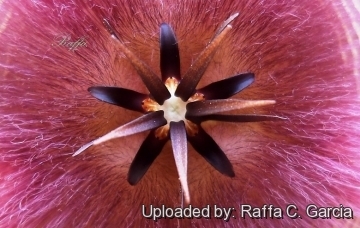 Flower: Dark-red, flat and densely covered by long hair at the centre that remember the fur of a dead animal. At the base of young stems. Peduncle round. Corolla width very variable, from 5-15 cm (usually 10/12 cm) across and very deeply lobed. The moderate carrion smell of the flowers attracts flies which may lay eggs on the flower. Sometimes fly larvae that have hatched from the eggs can be seen on the flower. Fruit: Flies pollinate the flowers resulting in the typical twin seed horns (follicles), which are decorative in themselves and often don't appear until a year later. Seeds: The pant readily produces seed which germinates 100% if sown when fresh. Phenology: Blossoming time: Flowers are freely produced throughout the late summer and autumn. 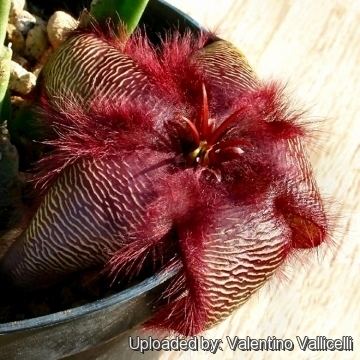 Notes: S. hirsuta was (along with Stapelia variegata later transferred to the genus Orbea) the second stapeliads to be discovered. 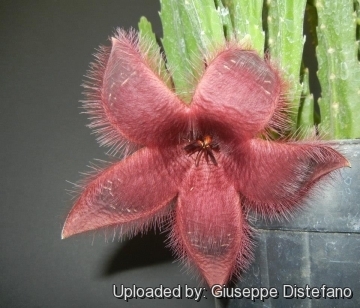 Linnaeus then described and set up the the new genus Stapelia in 1737 and based the genus on S. hirsuta that now stands for the type species of the genus. Cultivation and Propagation: Together with Stapelia gigantea and Orbea variegata, probably the most widely cultivated of stapeliads. 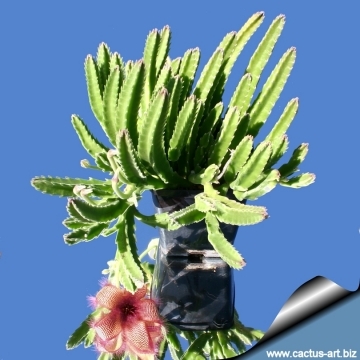 It is an easy obliging blooming plant when mature, they are happy in any average succulent house. Stapelia require moderately watering through the growing season but enjoy plenty of water and some fertiliser in hot weather, this helps them to flower freely. Water more sparingly in winter according to temperatures. But, as with most asclepiads, it is unwise to leave them wet in cold weather. Winter care presents no problems at 5°C with plenty of light. Since roots are quite shallow, use a cactus mix or add extra perlite or pumice to regular soil potting soil. A gritty, very free-draining compost is suitable, and clay pots help the plants to dry out between watering. 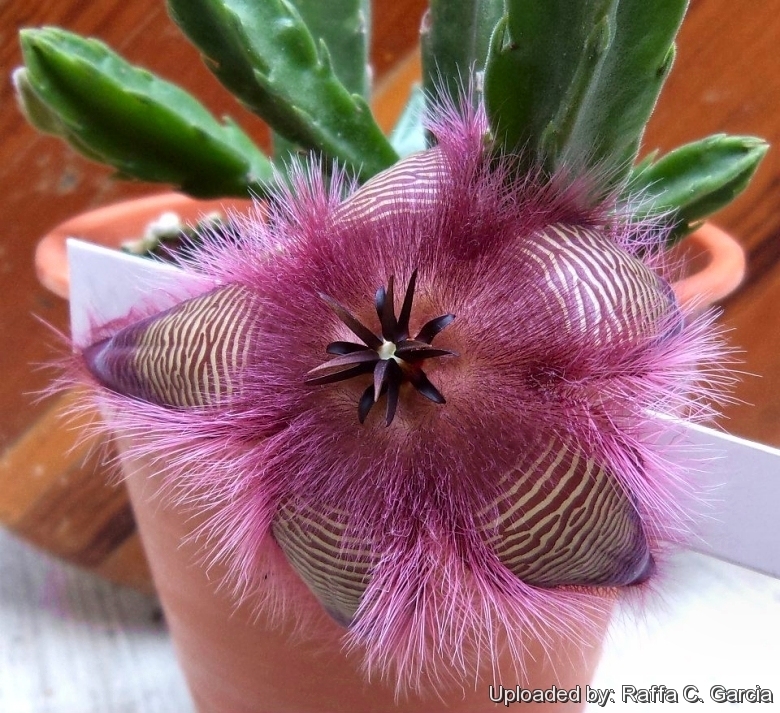 Pest and diseases: Stapelia species vary in their susceptibility to rotting, but are generally fairly easy to grow, especially if kept pest-free. They are very susceptible to stem and root mealy bugs, and damage from these may well initiate fungal attack. If you do have problems with a stem or with basal rotting, you can reliably isolate the healthy parts, dry them off, and re-root them in moist compost.